We saw disappointing data from Canada this morning as retail sales came out at -0.7% versus the forecast number of -0.4% and GDP came in at 0.0% versus the forecast of 0.1%. 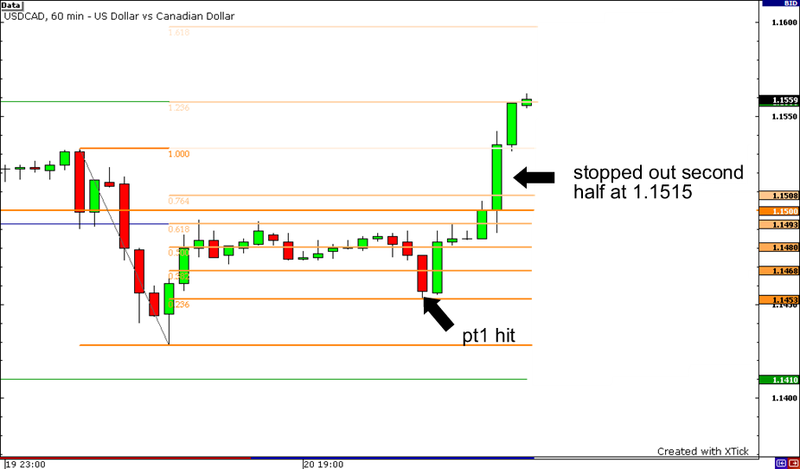 So, we saw USD/CAD jump up 30 pips shortly after the report, stopping out the second half of our trade at 1.1515. So, for those of you who didn’t get to move your stop to breakeven after pt1 was hit – like me – we made +20 pips on the first half and -35 pips on the second for a total of -15 pips. It looks like our first profit target was hit overnight during the Euro trading session before the pair shot back up to the 1.1500 level. You should have closed out half of your position at pt1 and still have the other half open if you didn’t adjust your stop on the second half. We have data coming out of Canada in the next few minutes, so we will hold on tight and see what happens after the report. Good luck! Well, it looks like it’s been a quiet market since we entered our trade earlier in the day. Honestly, as traders wind up their positions before going on holiday break, we will probably continue to see low volatility conditions, and a few spikes as news reports are released for the rest of the week. I plan on keeping my position open, with no changes to exit points. We have multiple economic reports out of Canada tomorrow morning at 8:30 am EST, including Retail Sales and monthly GDP numbers. Both are forecasted to be higher than previous numbers. We’ll just have to wait and see tomorrow. I’ll be watching tomorrow’s release, so stay tuned for any possible updates after the reports! Here’s a trade I’m looking at now. 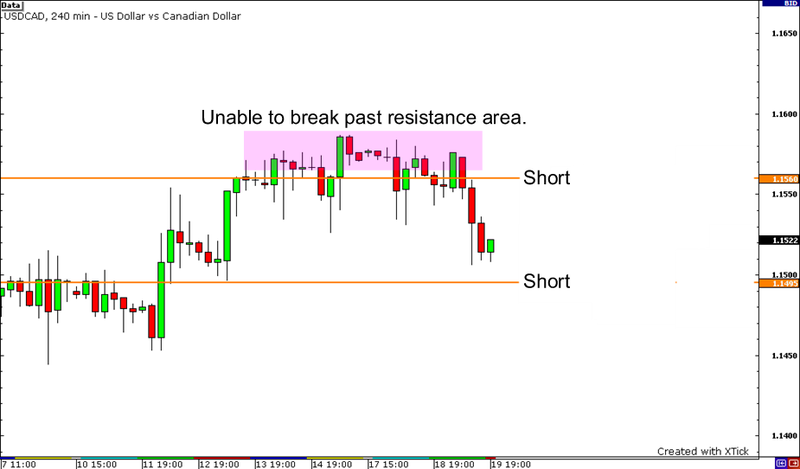 Basically, it’s a Fib retracement play to try to jump in the downtrend in USDCAD at a great price. We just saw weekly crude oil inventories drop lower than expected which should help push up the value of the loonie in the short term. In the longer term, I’m always for commodities versus the greenback, so we may hold this position if entered until the next trading day. Please remember to never risk more than 1% to 2% of your account on any one trade – even on demo accounts! Adjust your position sizes to this rule accordingly. Good luck and good trading! Also, I am looking for a trade opportunity in NZDUSD with New Zealand quarterly GDP coming out later at 4:45 pm EST. Stay tuned!